Bathroom Scale – Good or Evil? What would life be like if good or evil was no longer associated with the scale? Imagine life where the number is just a number. The number is a guide post, a mile marker letting you know where you are in relation to your goal. Quite simply, are you close to your goal, or do you have a ways to go? Anyone who has dealt with weight as an issue has a love / hate relationship with the bathroom scale. 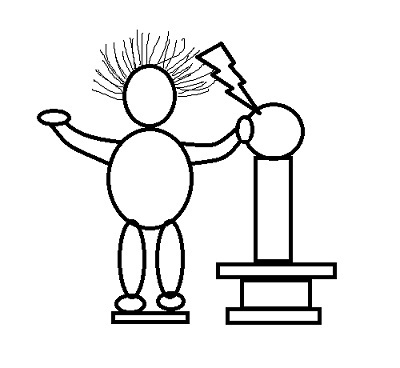 If my weight is up, watch my hair stand on end like I’m suddenly standing next to a Van de Graaff generator. If my weight is down, I instantly remember how to do cartwheels. Some of us DO have the opposite issue. Some of us are trying to GAIN weight. I know, in America this isn’t the most prevalent paradigm around the scale, but I would be remiss if I didn’t acknowledge those dealing with being under-weight. Their struggle is just as emotional and challenging as those of us trying to lose weight. I’ve tried ignoring the scale, and that didn’t work. I wound up achieving the highest weight of my adult life using that approach. I began to realize that the number on the scale was setting the tone for my entire day. I would have a “good” day if the scale was down, and a “bad” day if the scale was up. I finally had to come to terms with the scale. The scale is just data. The data tells me that if I decided to have “a little extra” over the weekend, that “little extra” showed up on the scale. It reminds me that the decisions I make with food have consequences. It’s not something I have to turn into a life-or-death decision every time I pick up the bottle of salad dressing, but I can use this to remind myself that two tablespoons of salad dressing is fine … four tablespoons (which doesn’t sound too bad until I realize that’s a quarter of a cup of liquid) is a bit too much. What is your relationship to the scale? What would the world be like if we could revolutionize our relationship to the bathroom scale? Please comment and let me know what you think. This entry was posted in Home Gym and tagged body mass index, calisthenics, dedication, exercise, exercise works, fitness, health, healthy-living, high blood pressure, Home fitness, intensity level, mental-health, motivation, patience, persistence, scale, weight, weight gain, weight loss. Bookmark the permalink. Precisely: the scale gives you one piece of data that by itself cannot give you a complete picture of your overall health. If the number on the scale went down, it just means that gravity affects you less today, but it doesn’t tell you if the weight you lost in the previous 24 hours was fat, muscle, water weight or some combination of the above. The scale may also reflect hormonal changes that cause you to retain water, stress factors that cause you to convert more calories into fat than usual, or any number of other factors that can cause your weight to fluctuate over time, but again, it does not provide a value judgement on any of that, only raw data. You are the one who assigns meaning to the number, so you are the only person that number can hurt if it’s not the number you want it to be. We should all focus instead on how we look and feel. Is our diet and exercise making us feel like we have more energy and ability to accomplish more? Do they produce the physical changes we’re pleased with? Are we healthier overall? Then by all means, keep doing what you’re doing, and don’t worry so much about whether you lost the number of pounds you thought you wanted. This is about quality of life, not adding to our already significant load of stress by worrying over whether a bathroom appliance approves of our lifestyles.